A friend encouraged me to participate in the Blogger’s Quilt Festival, hosted by Amy of Amy’s Creative Side. 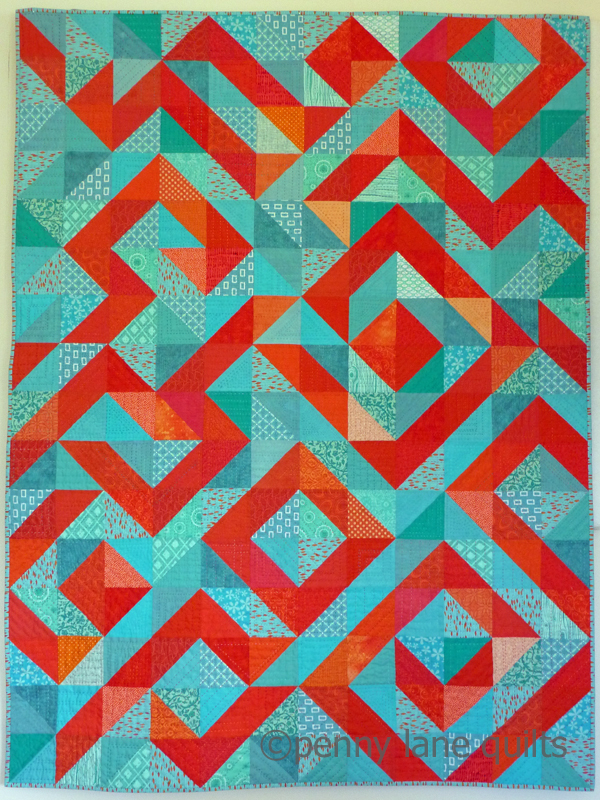 I’ve decided to enter one of my favorite quilts, Coral Reef, in the Hand Quilted category. This quilt was completed a couple of years ago, but it will always be a special finish for me. It was made before my blogging days, so this post is an opportunity to share its story. It began as a pile of half square triangle units created while at a retreat with some local quilty friends. 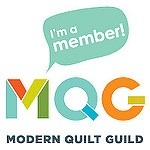 (The nearby Seattle MQG members had recently hosted a bicolor challenge which is what got me thinking about trying a two color quilt.) After much arranging and rearranging on my design floor, I decided on the final layout. When it was basted, I started machine quilting it, but after a few lines of quilting, I changed my mind and decided it would be more fun to hand quilt. So I dug out all my aqua and orange threads, put it in my hoop and started stitching. It was the perfect canvas for dense hand quilting with a variety of thread types and weights. (It was also a great excuse to buy some new threads!) I took an improvisational approach and made up the designs as I went without marking. It was so.much.fun! The texture created by the quilting is my favorite feature of the quilt. Planning to attend QuiltCon for the first time in 2015, I decided to enter the show, so I worked feverishly to finish it up before the deadline. That prize money was used to start a small home business, penny lane quilts. To see my current projects and upcoming events, you can also find me hanging out on IG at pennylanequilts and on Facebook at penny lane quilts. 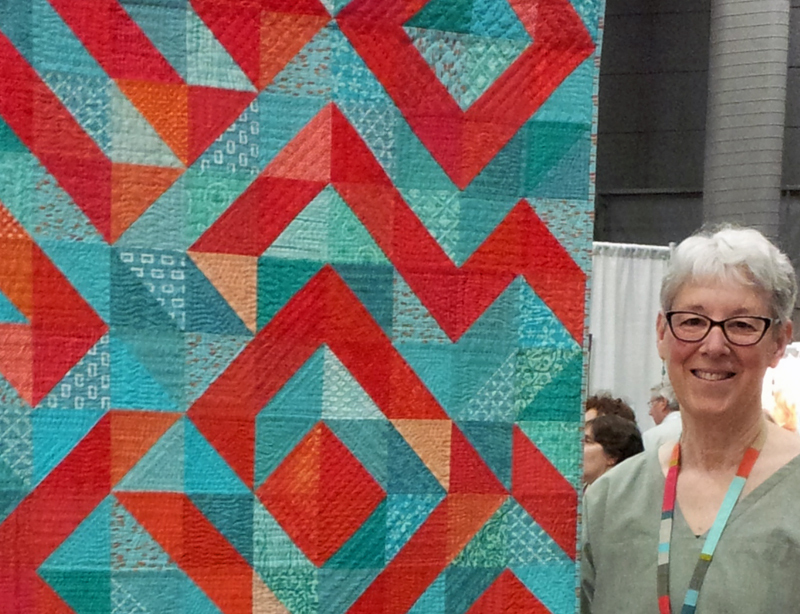 Coral Reef was exhibited in our local North Olympic Fiber Arts Festival last fall, and is currently traveling to some AQS Quiltweek shows in Grand Rapids, Chattanooga and in the upcoming Des Moines, Iowa event. I’m looking forward to having it back home soon! The backing fabric is a beautiful floral from Amy Butler’s Lark collection. This quilt remains one of my favorites, not because it won a ribbon, but because of all the hours that I spent lovingly stitching its layers together. I know many of you have seen this quilt before, but I hope you enjoyed learning a bit more about it. I currently am hand quilting away on another quilt, but Coral Reef taught me that I need to pace myself with hand work. Hopefully I will have the new one finished well before any deadlines…we’ll see! Thanks, it was fun to reflect on the fact that this one almost was machine quilted. Funny how decisions sometimes take you down a whole new path. This is wonderful. 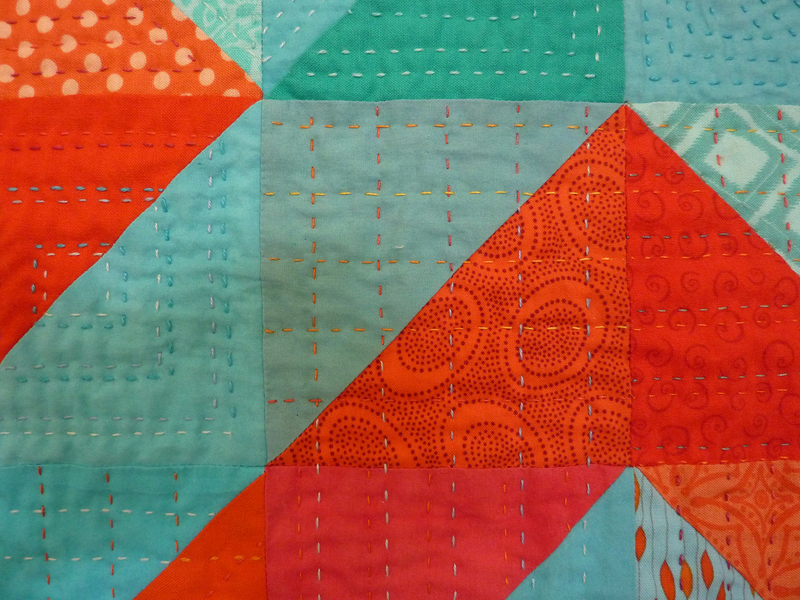 Love the colours and the gorgeous hand quilting really sets it off! So nice to hear the story behind its making. 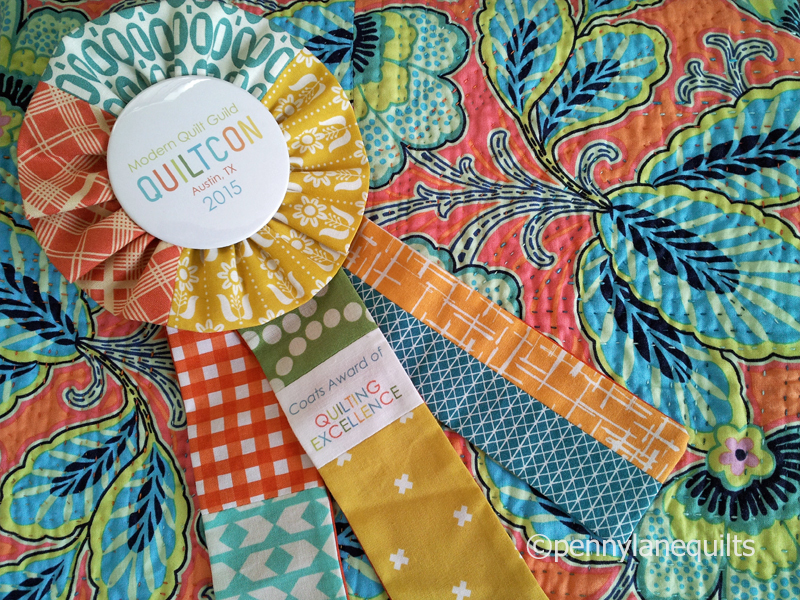 It was so beautiful hanging at QuiltCon where it received well deserved recognition! The photos just don’t do it justice! I like your approach to hand quilting this in different threads. I guess it paid off! Beautiful color combination and fun layout! And the quilting is just stunning, pity I can’t see in in person. Thanks! Yes, wouldn’t it be great if we could see all the quilts in person. I’d love for you to be able to touch this one, as well. My favorite thing about this quilt is how the hand quilting creates such a soft texture. Congrats!!! I love this quilt…and the quilting is very intersting. Fabulous!!! You got my vote. Thanks so much. It is one of my all time favorite color combos, too. I didn’t know it was hand quilted! I love the look of it. Congrats on winning the award. And it’s nice to see a peek of what you look like. Yes, Nicole, there are many months of hand quilting lovingly stitched into this one! I keep thinking I need to try and get a photo and add it to my sidebar. Maybe this week!